May has to be one of the most exciting months in my garden. I go out to during the day and I can discern growth in some plants from one day to the next. 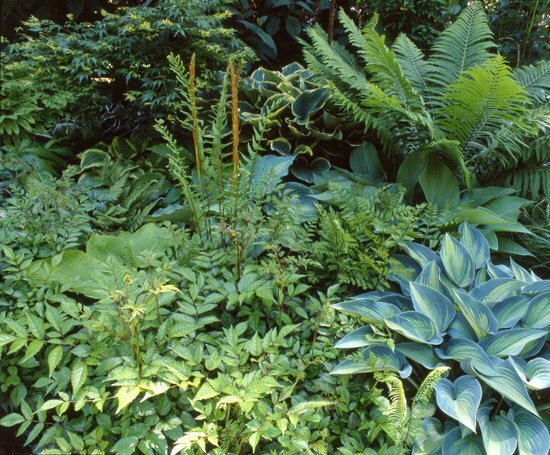 This is particularly the case with my hostas. In May and in June they look fresh and perfect. None more so than Hosta 'June' (abover,right). Because I obtained my June from the American Hosta Society when June first entered the stage my specimen is an English one. The 'June' available in Vancouver in local nurseries is an American version which I don't find as attractive. 'June' is a sport (mutation) of Hosta 'Halcyon' which is the most handsome and elegant blue hosta. English gardener Eric Smith crossed a Hosta 'Sieboldiana Elgans' (it flowers in June) with a Hosta 'Tardiflora' (flowers in September) that just happened to bloom early one year. From that cross Smith obtained some of the best blue hostas ever (called the Tardiana Group) that share the blue colour of 'Sieboldiana Elegans' with the pointed leaves of 'Tardiflora'. Most have mauve flowers and thick substanced leaves that resist slug damage.